It is always hard to pass up a ride in a vintage aircraft. 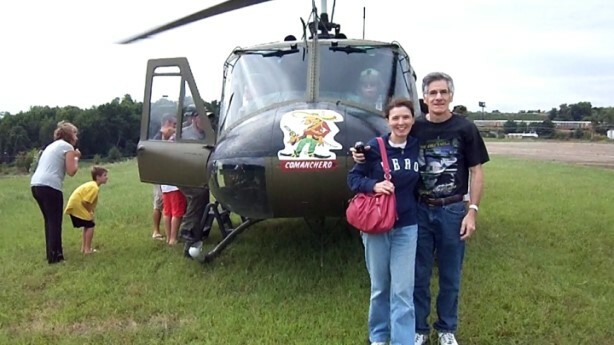 Usually, the price is not too awfully high, so on the rare occasion that Melanie and I go to an airshow, we try to be sure to fly in something. Last summer (2013), we rode on one of the 11 flying Ford Trimotors left in the world when it was visiting Erie Airport in Pennsylvania. The cost was an incredibly affordable $75 each, so we couldn't resist. This time we were at the airshow in Winston-Salem, North Carolina, and there was a crew with a Bell "Huey" UH-1 Iroquois and a Bell AH-1 Cobra. Rides were being offered at $65 per person. Who can pass that up? Not me. I can't imagine what it was like for our nation's soldiers who rode into and out of battle in these craft. The distinctive "whop-whop-whop" of the rotor blades is as much of a trademark as the "potato-potato-potato" sound of the Harley Davidson motorcycle. So, without further adieu, here in the condensed footage of our ride.